At certain times of the year we may find we are drawn to certain fragrances, like warm and spicy notes in the colder months from Autumn into Winter, and then bright floral and citrus scents in the Spring and Summer. 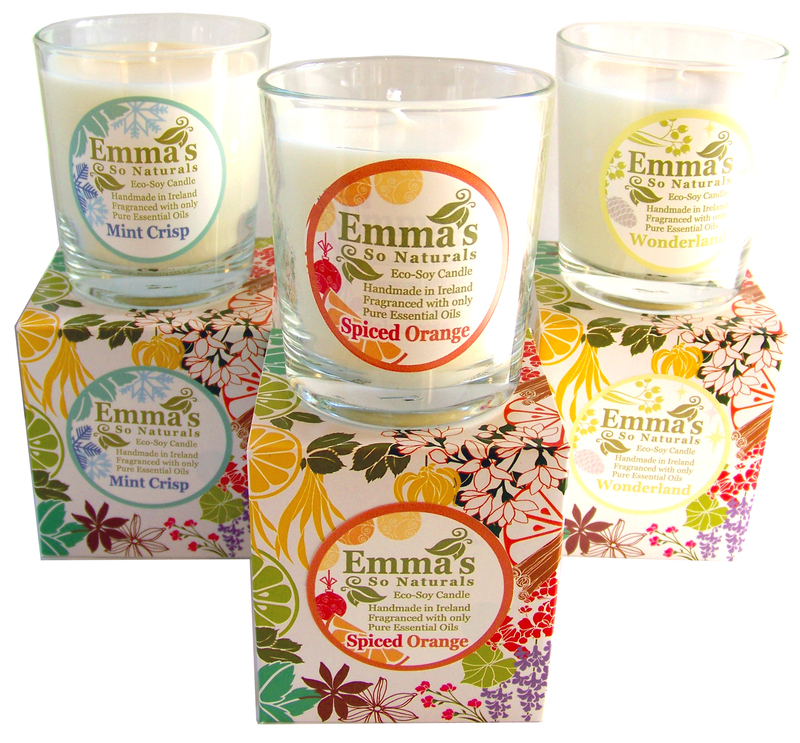 Emma has cleverly included pure essential oils in these seasonal blends that are particularly appropriate as these Pure Essential Oils have been carefully selected and blended for this specific season of chills and sniffles, because of their renowned medicinal and healing qualities including: comforting and antiseptic Benzoin Resin and Ginger Oils, air clearing Tea-Tree, Pine, Frankincense and Eucalyptus Oils, and stimulating Spearmint and Sweet Orange Oils. 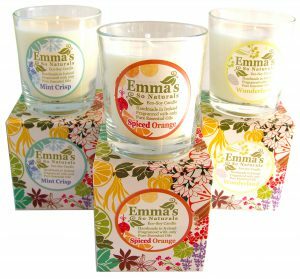 Complimenting the existing core Emma’s So Naturals Eco-Soy Candles range of currently 7 Pure Essential Oil fragrances, Emma’s three limited edition seasonal fragrances – released in good time for Christmas are ‘Mint Crisp’, ‘Spiced Orange’ & ‘Wonderland’. A blend of refreshing Spearmint, cleansing Tea Tree and warming Benzoin. Crisp and sweet, like a frost nipped lawn on a fresh winter morning! Spearmint oil is sweet and fruity-minty, it is refreshing, stimulating and uplifting. Tea tree oils smells sharp, herby and fresh, it is cleansing and is powerful at fighting infections. Together these oils can help with colds, sinusitis, bronchitis and any other respiratory ailment. Browse our Mint Crisp range now! A blend of uplifting Orange, warming Benzoin, spicy Ginger and festive Frankincense. Cuddle up in this warming and spicy sensory embrace! Sweet Orange is cheerful and uplifting, bringing feelings of happiness and warmth, and it is mildly sedating. Ginger oil is strong, spicy and warming and is also energising and uplifting, it too relieves colds and flu symptoms. Frankincense is wonderfully soothing and calming, it has an exotic woody, spicy smell. Browse our Spiced Orange range now! A blend of forest Pine, soothing Eucalyptus and warming Benzoin. Reminiscent of the fresh cleansing air you find on a refreshing winter trek through a hilly pine forest! Scotch Pine and Eucalyptus when blended together have a light, fresh forest smell, it is a light, woody, and earthy fragrance, and the blend has a cleansing and clearing effect on a room. Both oils are soothing and useful for relieving the effects of colds, cough and flu. Browse our Wonderland range now!